The tunic is scarlet with blue velvet facing and gold lace. The trousers are blue. His shoulder boards are gold lace RE officers pattern. His forage cap --on the table by his right hand--is gold lace. The six medals are, from left to right: the Baltic Medal, the 5th Class of the French Legion of Honour, the Crimea Medal with the Sebastopol clasp, the Distinguished Conduct Medal, the Turkish Crimea Medal, and the Army long Service and Good Conduct Medal. Since the photograph dates post-1861 (from the forage cap design), Beaumont must be a Captain. A Captain's rank insignia consists of a crown and star on the collar. Only the crown is visible in the photograph, with the star being covered by Beaumont's rather luxurious whiskers. Beaumont is wearing an 1857 pattern single-breasted tunic of scarlet cloth edged with blue velvet. The collars and cuffs are of garter blue velvet with a round back gold cord on the edge of the collar and collar seam. The shoulder knots are round back gold cord with a triple twist and silver embroidered grenades. 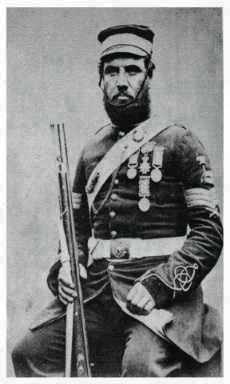 The medals worn by Beaumont are the Indian Mutiny Medal with one clasp and the Turkish Crimea Medal with ring suspender. The trousers are dark blue with a gold lace stripe of the Corps pattern, 1-3/4 inches wide, down the outer seam. The forage cap is of blue cloth with a horizontal projecting peak (1861 pattern) and a band of gold lace, 1-3/4 inches wide of the Corps pattern. The cap appears to be missing the gold netted button in the centre of the crown. The pouch belt is of Russia leather, 2 inches wide, with one stripe of gold embroidery 3/8-inch wide on either edge and one wavy stripe (in a scroll) down the centre. The sword belt, worn over the tunic, is of Russia leather, 1-1/2 inches wide, with two stripes of gold embroidery 1/4-inch wide, plain gilt buckles, and a gilt waistbelt clasp with the Corps of Royal Engineers' device in silver. His sword is the regulation pattern blade for Infantry, 32-1/2 inches long by 1-1/8 inches wide, hilt of rolled metal, gilt, scroll pattern, pierced and engraved. The sword knot is a round gold cord with acorn. 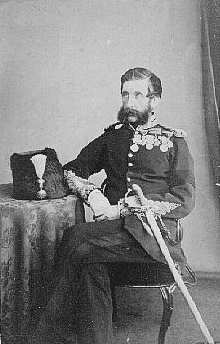 General Sir James Frankfort Manners Browne, K.C.B. 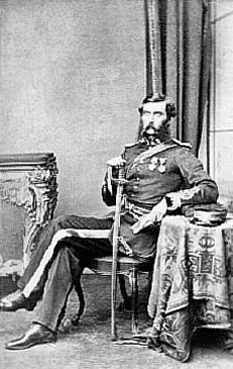 In the photograph, Browne is wearing the 1857 pattern full dress uniform of a Lieutenant Colonel of Engineers serving with troops, as denoted by the 1857 pattern busby on the table. The tunic is of scarlet cloth edged with blue velvet, single-breasted, with buttons 2 inches apart. The collar and cuffs are also of blue velvet. There is a round back gold cord on the edge of the collar and collar seam with his badge of rank (a crown) in silver embroidery on the collar. The shoulder knot is of round back gold cord with a triple twist and silver embroidered grenade. The busby is of picked seal skin, 8 inches high in front and 9-1/2 inches high in back, with a light blue bag hanging over the right side and hooked down to the busby. The busby has a leather chin strap, and a gilt grenade on the left side to hold the 6-inch white goat's hair plume. The trousers are dark blue with a scarlet stripe, rather than the regulation gold lace stripe, down the outer seam. 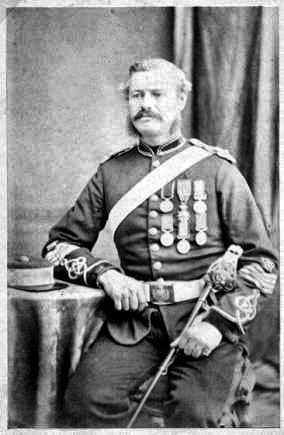 General Sir James Frankfort Manners Browne is wearing the Crimea Medal with Sebastopol clasp, the Sardinian Al-Valour Militare and Turkish Crimea medals, and the Turkish Order of Medjidie (5th Class). The sword is the regulation pattern blade for infantry, 32-1/2 inches long by 1-1/8 inches wide, with a hilt of rolled gilt metal, with a scroll pattern, pierced and engraved. The sword is in a brass scabbard and the sword knot is of round gold cord with an acorn tip. 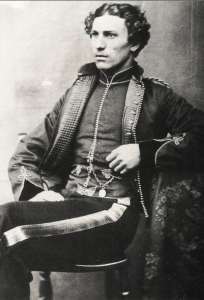 Marsh is wearing the 1857 pattern waistcoat, trousers, and frock coat, with an 1861 pattern forage cap. 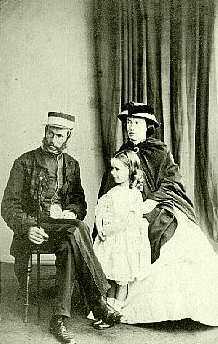 Colonel Willoughby Digby Marsh, RE, his wife, and his daughter. The waistcoat is of scarlet cloth, single-breasted, hook-and-eye design, with gilt studs down the front; plain gold braid all round on the collar and seam. 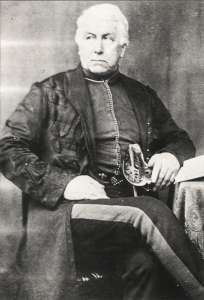 The pockets on the waistcoat (which cannot be seen in the photograph) are edged top and bottom with gold braid with a crow's foot at each end and a treble twist in the centre. The trousers are dark blue with a scarlet stripe 1-3/4 inches wide down the outer seam. The frock coat is of dark blue cloth, single-breasted, with a rolling collar and hook-and-eyes. The coat has eight loops of 3/4-inch mohair braid down the front, and two rows of nettled barrel buttons 1-1/8 inch long on each side. The forage cap is of dark blue cloth with a gold netted button in the centre of the crown, which is in eight parts and edged with scarlet piping. The cap has a band of gold lace 1-3/4 inches wide of the Corps pattern and a horizontal projecting peak. This style of peaked forage cap was introduced into the Royal Engineers in 1861. Dress Regulations for this period specify that "the frock coat to be worn always with scarlet waistcoat ... and forage cap on regimental courts-martial, courts of inquiry, and committees, inspection of barracks, etc., and as a common dress in quarters." 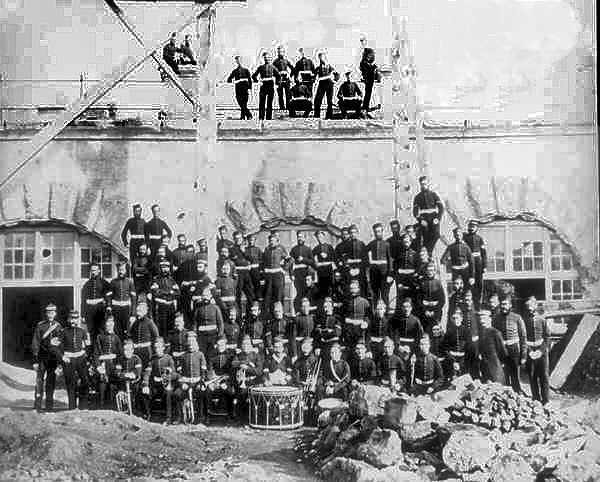 This group of Royal Engineers (the Royal Sappers and Miners became a part of the Royal Engineers in 1856) has a cross section of young soldiers to some of the oldest, gnarled veterans of the Crimea. All are wearing forage caps, those of the NCOs having a peak. above, left, Major General H. Sandham, Director of the Royal Engineer Establishment, c 1860, wearing the undress frock coat. This garment was worn with the scarlet waistcoat showing at the top above the lapels. 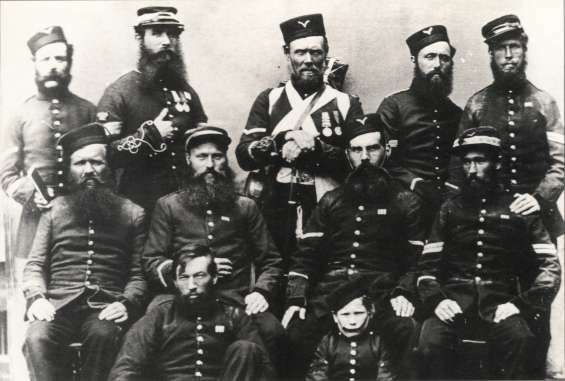 Above right, the scarlet shell jacket worn as a mess kit with scarlet waistcoat and gold-laced trousers, c. 1857.